Student applications due by Sunday, April 28, 2019 at 11:59 PM Pacific. 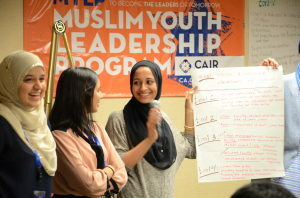 Advisor Recruitment: MYLP relies on the support of young leaders in our community to serve as advisors during the program. All advisors are assigned to a group of 3-4 students and are responsible for creating a welcoming and safe environment. Interested college students and young professionals should submit applications by April 21, 2019 at 11:59 PM Pacific. For details, contact your local CAIR-CA office.